Take the weight of oil, cans, filters and tools off the backs of your maintenance operators and put it on the wheels! IFH offers more than 100 standard models of mobile fluid handling carts to make life easier for your maintenance operators…and you! How Can I Benefit from an IFH Fluid Handling Cart? 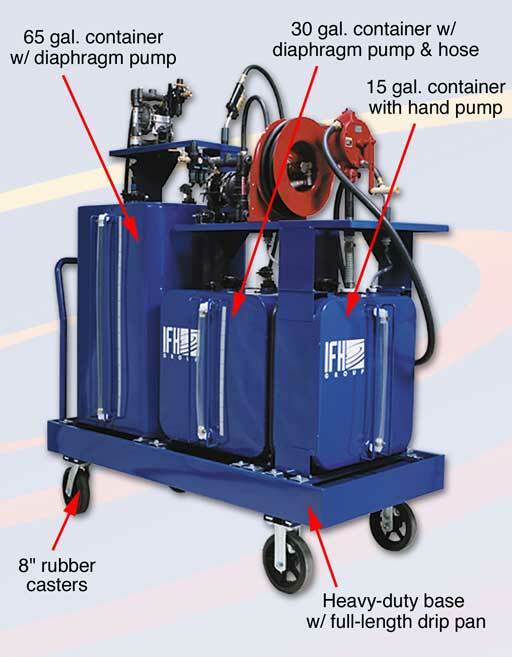 Fluid Handling Cart containers hold 15, 30, 60 gallons…or more! Storage space on all fluid handling carts for cans, rags, grease guns, wrenches, etc. No spills – each fluid handling cart base is one big drip pan! How Can I Reduce Labor Costs with an IFH Fluid Handling Cart? Sight gauges and gallonage strips makes inventory control much easier. You will save money by not needing extra product as stand by. No more down time due to product shortage created by poor inventory management. The ten gallons of additional capacity allows you to pump all of the product out of a 55 gallon drum and into the system before the overhead container is empty. This reduces the downtime of employees changing drum pumps.